Next week, the Gilder Lehrman Center for the Study of Slavery, Resistance, and Abolition and the Yale Center for British Art are co-hosting a major international conference on slavery and British culture in the eighteenth century. The art exhibit associated with the conference is remarkable for many reasons, not least because it features a portrait of Elihu Yale being waited upon by a collared slave (euphemized as a “page” in the original listing). The painting is related to one held by the University Art Gallery, showing the same scene from a different perspective. 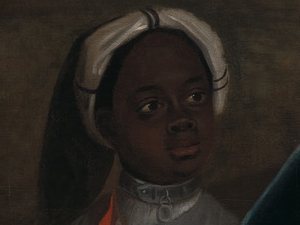 And it is similar to another portrait of Yale with yet another collared slave (this time euphemized as a “servant”). This latter portrait, even more ominous and imperial than the first, is not a part of the exhibit. And that is a shame, because these paintings, and the larger conference of which they are a part, offer an opportunity to revisit the controversial and entangled history of slavery and universities. Historians have long pointed out that Yale (the University) is deeply implicated in the institution of slavery. Many of its prominent buildings are named after slaveholders or slavery apologists. It housed so many southern students that it briefly seceded from the Union at the start of the Civil War. 1 Craig Wilder’s wonderful book Ebony & Ivy, published last year, shows that Yale is not alone in this regard. All of early America’s leading universities, both north and south, promoted and profited from slavery, racism, and colonialism. 2 At the same time, college campuses were battlegrounds where antislavery students and faculty engaged in dramatic confrontations with their opponents and developed new political movements. 3 Oddly enough, none of the scholarship on these issues mentions that Elihu Yale, the namesake of this august and venerable institution, was himself an active and successful slave trader. As an official for the East India Company in Madras (present-day Chennai), Yale presided over an important node of the Indian Ocean slave trade. Much larger in duration and scope than its Atlantic counterpart, the Indian Ocean trade linked southeast Asia with the Middle East, the Indonesian archipelago, and the African littoral. On the subcontinent, it connected with and drew upon traditions of slavery and servitude that had flourished for generations. 4 In the 1680s, when Yale served on the governing council at Fort St. George on the Madras coast, a devastating famine led to an uptick in the local slave trade. As more and more bodies became available on the open market, Yale and other company officials took advantage of the labor surplus, buying hundreds of slaves and shipping them to the English colony on Saint Helena. Yale participated in a meeting that ordered a minimum of ten slaves sent on every outbound European ship. 5 In just one month in 1687, Fort St. George exported at least 665 individuals. 6 As governor and president of the Madras settlement, Yale enforced the ten-slaves-per-vessel rule. On two separate occasions, he sentenced “black Criminalls” accused of burglary to suffer whipping, branding, and foreign enslavement. 7 Although he probably did not own any of these people – the majority were held as the property of the East India Company – he certainly profited both directly and indirectly from their sale. Some sources (including Wikipedia) portray Elihu Yale as an heroic abolitionist, almost single-handedly ending the slave trade in Madras. 8 This is incredibly misleading. During his tenure as governor, Yale made an effort to curb the stealing of children and others for the purpose of export. But a close reading of company documents reveals that it was anything but an act of humanitarian altruism. It was, in fact, the local Mughal government, which held more power than the tenuous English merchants, that insisted on abolition. Yale’s decree of May 1688 curbing the transport of slaves from Madras argued that the trade had become more trouble than it was worth. The surfeit of slaves from the previous year’s famine had dried up, and the indigenous government had “brought great complaints & troubles…for the loss of their Children & Servants Sperited and Stoln from them.” 9 With no profit left for the company and a hostile Mughal overlord demanding abolition, Yale was happy to comply. Apologists might counter that Yale was a man of his time. Slavery was impossible to avoid, nobody opposed it, and most rich and successful people had a hand in it. None of that is true. In April 1688, less than a year after Yale became governor of Madras, a group of Quakers in Germantown, Pennsylvania, issued a statement condemning slavery in the colony: “There is a saying that we shall doe to all men licke as we will be done ourselves; macking no difference of what generation, descent or Colour they are. and those who steal or robb men, and those who buy or purchase them, are they not all alicke?” Quakers shed their ties to slavery during the eighteenth century while building a reputation as profitable and successful merchants. And they were hardly the only ones to protest the institution. In 1712, a major slave rebellion erupted in New York City, in which at least nine Europeans and twenty-seven Africans lost their lives. Several years later, when Yale College took its present name, opposition to slavery was endemic across the British Empire. 12 This was the broader world in which Elihu Yale worked, schemed, and built his fortune. The evidence establishing Yale’s involvement in the slave trade is clear and compelling. Thanks to the Internet Archive, HathiTrust, and Duke University, almost all of the official records of Fort St. George are available online, and even more documents await future researchers. Those looking for further information can follow my footnotes. Hopefully other scholars will build on this record to paint a more complete picture of the stoic British gentleman and his dark, diminutive servants, forever bound together in those disturbing oil portraits.